7 must-have tech items to help you spring into summer. Summer is officially upon us, and with it comes long weekends, barbecues and family vacations. Before you head out, whether to your backyard or to your favorite vacation spot, check out a few items that could make your summer days move easier. From speakers you can submerge in the water to a robot that will clean your grill for you, here are seven must-have tech items to help take your summer to the next level. Smartphone Charger for Wall Outlets. If you — or your kids or pets — have ever walked past a phone charging on a countertop and nearly whipped it to the floor when you accidentally caught on the dangling cord, the Rabbit Charger might just be the solution. Replace the faceplate of your current outlet with this block, and you’ll be able to pull out a 28-inch retractable cord with two Micro USB and two USB-C charging tips. You can switch the ends out depending on what your devices use, and you can also purchase certified Lightning tips for Apple devices. You do sacrifice one outlet to accommodate the charger, but two devices can power up simultaneously from that hub. At $49.95, it’s not the cheapest charging solution, but it does clear the clutter and offer two charging ports from one outlet, which is handy during summer get-togethers. Enjoy your morning caffeine at just the right temperature for much longer on those mornings off with a smart mug. You can set this 10-ounce ceramic mug from Ember to your preferred temperature from its base coaster or from its app on your smartphone or smartwatch, which will also notify you when your coffee or tea is hot. $79.95. Once you head outside for the day, throw a speaker in the pool. 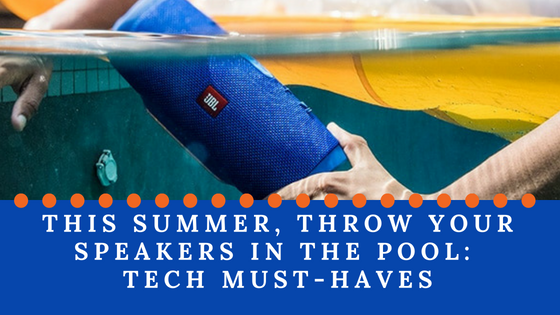 That’s right —these waterproof speakers can be tossed right into the water, so you’ll be able to stream your favorite music right next to you in the pool, without having to blare the sound from your patio. JBL makes a range of waterproof speakers from $59.95 to $199.95. From solar stoves to a barbecue grate you can store on your spare tire, innovations in cookout technology are never in short supply. Check out this guide from Digital Trends for recommendations on a budget-friendly cast-iron smoker box ($18), a smart propane tank gauge you can check from your phone ($43), a grill-cleaning robot ($90) and more. This raft from Canopy Island looks like it could be more comfortable than your own bed. $142.98. There’s something special about underwater photos, but most of us don’t have the tech to make it happen and may not use it enough to invest in a GoPro. You might get more mileage out of underwater housing for your smartphone camera, like this case from AxisGo for the iPhone 7/8. It will set you back $199, but it’s difficult to entrust your iPhone to sale-rack cases when water is involved. If you have a GoPro already, though, you can snag underwater housing, filters and accessories for under $50. For just $65, HP makes its LifeCam, a GoPro-style camera that can capture 4K, time-lapse video and more, with Wi-Fi transfer to your smartphone. It comes with a waterproof case. Take ambient light with you with something like the Eve Flare Smart LED Lamp from Elgato, which features adjustable colors that aren’t harsh like typical LED light. It’s water resistant, sleek and holds up to six hours of charge. It also charges wirelessly and can be controlled through Siri. While Elgato makes a range of smart-home products, the Eve Flare is still a preorder in the United States. $116.75. If you’re looking for something easier to pack up and take camping or to the beach, try the LuminAid 2-in-1 solar lantern and phone charger, good for about 50 hours of light and chargeable via solar power or USB. It’s lightweight, packs flat and doesn’t heat up. Brightness is adjustable, and it can flash to draw attention in case of emergency. Great for hikes and campsites, but because it’s waterproof and inflatable, you can also throw it in the pool. Starts at $49.99. Because of its solar capability, compact design and ability to float, LuminAid has been able to provide a safe, rechargeable light sources to disaster relief zones and places that rely on toxic, expensive and dangerous kerosene lanterns as their primary light source. If you want to support their Give Light Program, click here to learn more — if you give a light, you get a light, too. Check out GadgetFlow’s compilation for more summer tech must-haves here, from a frozen yogurt maker to an electric standup paddleboard.